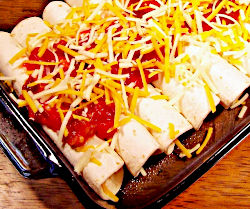 Spicy two-cheese enchiladas served with rice and beans. Spray a rectangular baking dish with non-stick cooking spray. Preheat oven to 350 degrees. Grate cheeses and blend together. Set one quarter of the cheese aside. Chop green onions and mix with the larger portion of cheese. Divide mixture and spread down the center of each tortilla. Rollup tortillas and place in baking pan, seam down. Pour salsa over the top and sprinkle with remaining cheese. Bake for 15 minutes or until bubbly and hot in the middle. While enchiladas bake, warm beans in a saucepan over medium-low heat, stirring often. Place water in a saucepan for rice, turn burner on to high heat. Dice bell peppers and add to water with canned tomatoes. When water reaches boiling, stir in rice, reduce heat to low and cover. When rice has absorbed all the moisture, serve with enchiladas and beans topped with diced onion.